ERUPTING like a volcano that had lain dormant for several decades, the masses in Zimbabwe this week vented their anger on any object they came across - burning tyres, as well as barricading roads - the culmination of a year of squandered opportunities following the dramatic toppling of former president Robert Mugabe in November 2017. President Emmerson Mnangagwa's "Second Republic" transformed into a war zone, with a wave of mass protests spreading rapidly like a tsunami in many towns across the country after the Zimbabwe Congress of Trade Unions called a three-day stayaway. Sparked by the incessant escalation of prices of goods, especially fuel, which prompted commuter omnibus operators to hike fares, the demonstrations exposed how government was struggling to contain citizens' growing discontent and its dismal failure to better the livelihoods of many as was anticipated by the majority who were meant to believe that the 2017 coup was a historic milestone towards development and the restoration of democracy. In the dormitory town of Chitungwiza, what began as a normal working day on Monday, suddenly morphed into a battlefield after protestors blocked all roads leading to Harare. In scenes reminiscent of an action movie, residents pursued the police after being teargassed in places like Chigovanyika and Huruyadzo, forcing the state security agents to retreat into St Mary's Police Station. 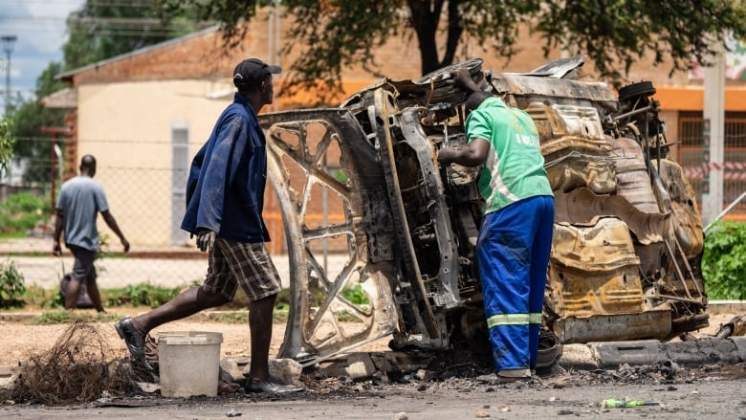 Celebrating victory and emphatically declaring themselves heroes, protestors marched to Town Centre, enroute Chikwanha, leaving a trail of garbage - in the form of stones, scrap metal, among other debris that prevented traffic from navigating through. With common intent, the mob went on to loot Choppies supermarket at Town Centre, while a popular beer outlet, Tanza Centre, was not spared. A police station at Makoni shopping centre was set ablaze as demonstrators avenged the shooting of one of their own. It was a busy day, with not much visibility of police officers and the army. A spectacle that would catch the eye of any observer was the presence of children of school-going age - mostly below the age of 12, who constituted the frontline of some groups as they converged from various directions of Chitungwiza to express their disapproval to the government's failure to cushion them from the ruinous effects of economic decay. The children threw stones at billboards, denounced President Mnangagwa and Zanu-PF, while adults provided "fortifications" for them in case of a counter-attack from the unknown. The tragic dramaturgy is marked by intriguing twisting plots of terror, sorrow, torture and uncertainty. After the demonstrations, the military, in different parts of the country, made a follow-up on the alleged perpetrators of violence, harassing and beating them up, a situation described by some victims as a violation of human rights, barely five months after innocent civilians were killed by soldiers in the post-July 30 general elections. The grotesque picture currently blighting high-density residential areas is a tale of a Goliath who constantly and mercilessly stamps his gigantic foot on a weaponless David. Some have reportedly been killed in broad daylight, while others have deserted their homes to sleep in maize fields and nearby hills. Tapera Madzivazvido, a resident of Mabvuku - another epicentre of demonstrations that rocked Harare since Monday - was left with his mouth injured, a gap in his teeth and his back in excruciating pain after being assaulted by soldiers. Narrating his horrific ordeal, Madzivazvido said: "At around 8pm on Monday, a group of about eight soldiers harshly ordered me to open the door, which I innocently did. They forced themselves in my house and started beating me up in front of my three-year-old daughter. They were accusing me of being part of those who barricaded roads. All of them stampeded to get their baton sticks on my flesh. Were it not for my daughter's screams, I could have been left for dead. After about 20 minutes of torture, they left my house." He also said most men in Mabvuku were victims of state security agents' indiscriminate beatings and torture, saying the majority found sanctuary at a house where residents were gathered for a funeral. "The situation was horrible as men had to desert their homes wearing shorts to pretend they were attending a funeral. Some were abducted and nobody knows where they were taken to or what happened to them. Only women were safe. The situation is tense," Madzivazvido said. Several reports in the city claim residents in Dzivaresekwa, Kuwadzana, Warren Park, among other places, are living in fear of reprisal by state security agencies, especially soldiers, who are reportedly patrolling suburbs unleashing terror on civilians. Meanwhile, a pensioned couple in Sunningdale almost suffered heart attacks after 10 soldiers wielding AK47 rifles and faces covered with balaclavas descended on their house on Monday in pursuit of three teenagers from the neighbourhood that had sought refuge in their home. The couple, Memory and Michael Moyo, were pushed and shoved, as the soldiers forced their way in, damaging the beautiful flowers in their garden. "They also broke down my gate and hurt my fingers and arms as they shoved past me at the gate, demanding to see the three teens. Imagine 10 soldiers with AK47s and masks going through your whole house. They harshly demanded to know from my grandchildren if this was their home," she sobbed. "My grandchildren are still traumatised. After searching the house, they fished out one of the teens from the bathroom and made him lie face-down on the concrete pavement. Each time, they lifted their batons as if in competition, and hit the poor boy's back, my heart almost skipped a beat and my skin crawled as if in pain. The boy mourned in pain and my heart sank. I have never seen such a beating, not even on television. "But as they turned their attention to my 75 year-old husband, who suffers from dementia, I went on my knees, with tears streaming down my chicks and begged them to spare him. I told them he was a sick old man; only then did they leave him alone. But why are they doing this, even to people who are not involved in the protests?" she asked. This came in the wake of continued closure of schools, most businesses, which the authorities erroneously believed could be resolved by exterminating citizens' communication links by switching off internet access. The move could be a massive step backwards, considering Mnangagwa is on record as saying Zimbabwe is open for business, but undemocratic tendencies are taking their toll.